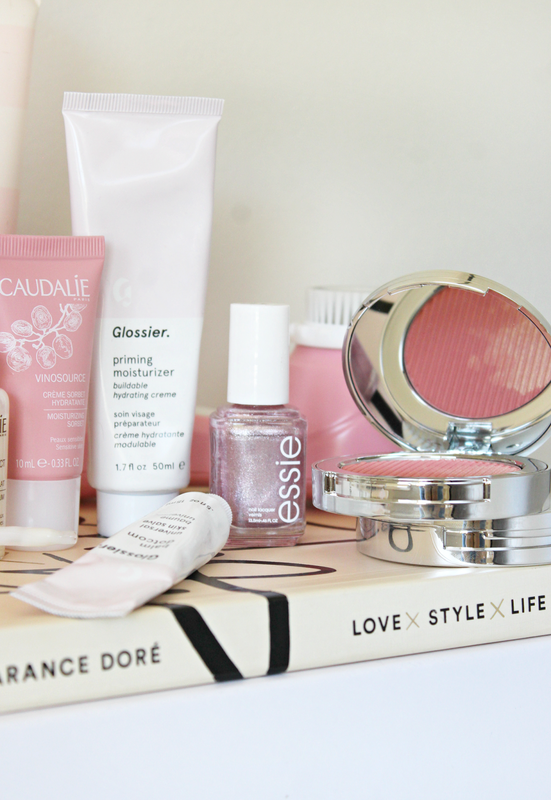 I have so many beauty favourites to share with you all this month! There seems to have been an accidental pink theme going on with all my beauty picks for August, but I guess it worked out in the end because everything seems to co-ordinate for the photographs. There’s a real mix of everything, from skincare to body care to makeup and nail loves. I’ve been trialing a lot this month so these picks are the best of the bunch, the real summer stand-outs! Starting off with skincare, the Magnitone Bare Faced Sonic Cleansing Brush* was featured in this post at the start of August, but I’ve actually been loving it for several months. It’s a more affordable choice for a sonic cleansing facial brush, and it really works at getting my pores feeling incredibly clean so that they can absorb all the lotions and potions that I apply afterwards even better. I highly recommend investing in a sonic face brush if you don’t have one already, it’s honestly made such a difference in my skincare routine. Speaking of lotions, I prefer using lightweight whipped moisturisers throughout the warmer months to avoid the greasy, sticky feeling on my face. The Caudalie Moisturising Sorbet has been an absolute treat for this – paired with the Caudalie Vinoperfect Radiance Serum, I have the perfect morning moisturising duo. Both products are very light in texture, and sink into the skin really quickly without any shine or residue. I love the glow boosting factor within the serum, it works beautifully under makeup to enhance a natural sunkissed glow. At nighttime, I’m always looking for something a little more heavy duty, but not overly so. I placed an order on Glossier about a month ago, and every since the products arrived I’ve been smitten with all of them. However, my skin nourishing favourite has definitely been the Glossier Original Balm Dotcom which I actually keep in my bag for handy touch ups (say goodbye to chapped lips forever, yayyy). I also love the Glossier Priming Moisturiser for some lighter moisture before bed, but I think I’m going to opt for the rich version next time because I have extremely parched skin and I still need a little extra. 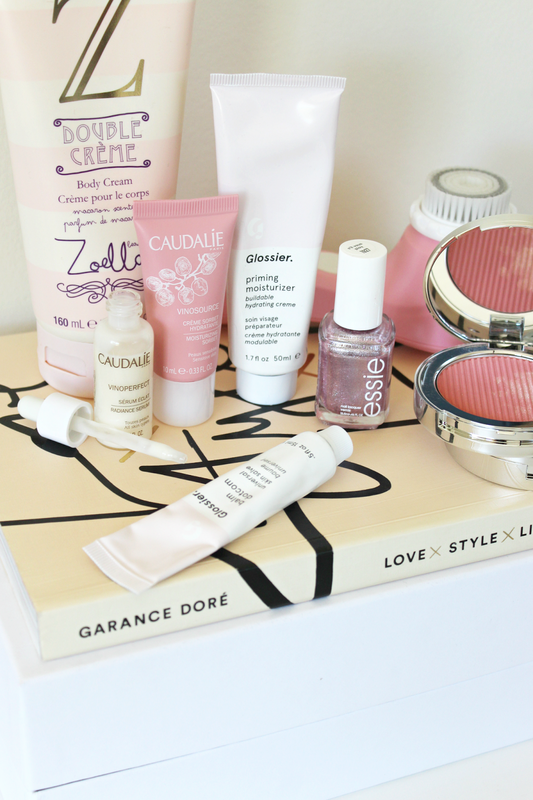 My makeup must have for August has definitely been The Estee Edit Blush in Coy Coral. I honestly think it’s one of the most perfect coral shades out there (it’s competition being NARS Torrid Blush). The pigmentation is buildable and gorgeous, and you can go as light or as heavy as you want without the product becoming patchy or blotchy over your foundation. The colour itself will work as a perfect transition into Autumn as well – but you’ll have to get your hands on it whilst you can because the whole line is going out of stock soon! Onto more playful colour, the Essie Nailvarnish in S’il Vous Play has been pretty much all I’ve sported this month (actually, as I’m typing this, I realised I had just replaced it with Essie Chinchilly yesterday, but still). I honestly cannot get enough of how gorgeous the colour and shine is… even my other half is in love with it. The shade itself is a beautiful lavender foil which is incredibly reflective in the light and the wear time is incredible (I think I wore it for a whole week before there was a single chip). Highly recommend. And last but not least, I purchased the Zoella Beauty Double Creme Body Cream in the sale from Feel Unique last month and I’ve been slathering it all over myself every night because it smells absolutely divine. If you’re a fan of sweet scents, this one would be right up your alley. It absorbs into the skin really well so there’s no sticky wait after the shower, but the scent lingers well into the next morning. I’m in love! Previous Post The Zoella Jelly & Gelato Collection.